First, I carry quite a large bag. 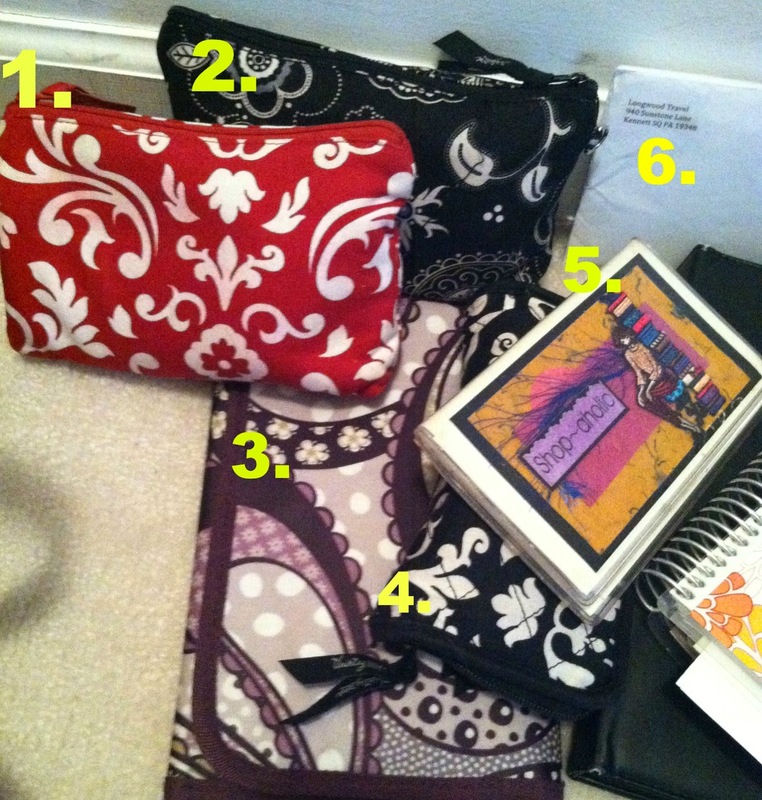 I am a Thirty-One consultant on the side and have a bazillion bags. The Cindy Tote is my go-to-every day work bag and I love that it holds so much and has pockets for little things and medium sized things like my check book. As you will see when I dump out my purse, I carry a lot around with me on a daily basis. Complete with a lobster hairclip on the strap, my swiss dot Cindy Tote is ready to GO! I typically have my planner, iPad, iPad charger, notebook, pens, pens, and more pens, as well as other things stuffed in this bag! It is a wonder my shoulder doesn't fall off! I really try hard to be organized. Sometimes I think I try too hard because I have so much with me at any given moment that is is very difficult to find what I am looking for swiftly. 1. This pouch carries iPad or iPhone chargers, hand sanitizer, lip gloss, parking validations for the parking garage at work, hair pins, and sun tan lotion. The sun tan lotion is leftover from the summer. I should probably clean that out. hmmm. 2. This pouch holds all my pens. I like pens and prefer to have them in many colors so I can write with whatever color strikes my fancy. I also carry highlighters with me. There are also a couple of Avon Glitterstick eyeliners in this bag as I forgot to take them out after receiving them. I tend to put things places; again thinking that I am organized, and then forget about them. 3. 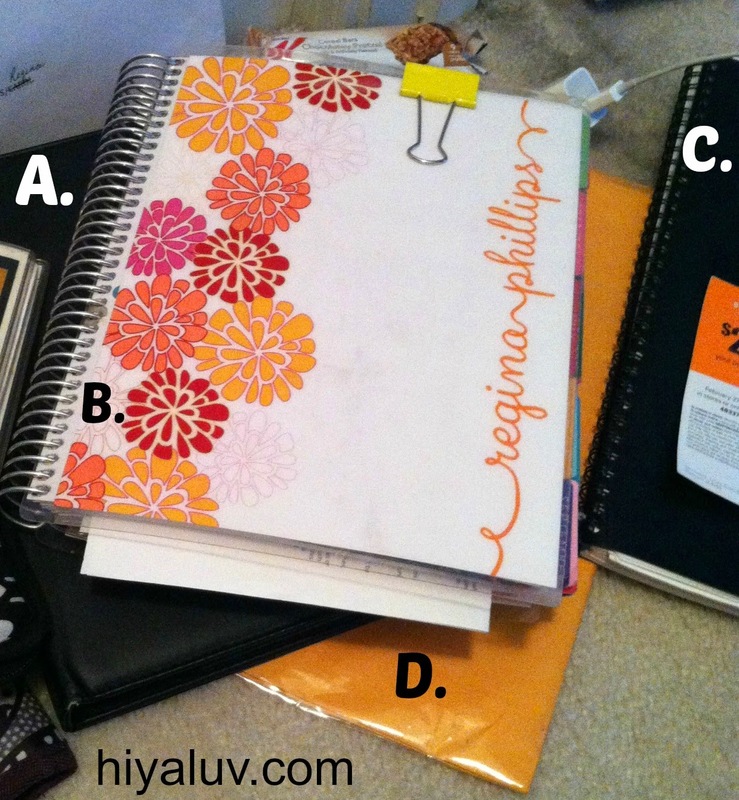 The Fold & Go Organizer has made my life so much easier. Inside, you will find a notepad that holds our weekly grocery lists, pockets full of coupons, and a zipper pouch filled with pens. I'm telling you, I really like pens apparently! Ha! I carry this with me everywhere. I never know when I am going to have some extra time to swing by the store and grab something on our grocery list. I also try to keep sale ads or other important money saving materials such as coupons in this organizer. It is all in one place and keeps me from going crazy trying to find coupons while in the middle of the check out line at the grocery. 4. My wallet. Nothing exciting. I never carry cash. I go through it waaayyyy toooooo fast. AND I do not remember what I spend cash on. I of course have my debit card, credit cards, loyalty/reward program cards, and business cards in this wallet. It really does hold a lot and often times I feel like it is a filing cabinet because I tend to hold on to receipts. I am trying not to keep receipts as long as I have in the past. When I can, I request an email or text message receipt to eliminate so much paper. 5. I used to be a shop-a-holic which made this check book cover fitting. I have always liked it and thought it was cute. Ever since I married a CPA, I haven't really been the shop-a-holic type. We are on a budget trying to pay off my student loans and credit card debt. We are hoping to be debt free in the next year or so and that would be such an accomplishment! 6. This white envelope is pretty special! It holds my airplane ticket and trip itinerary for Paris. My grandma and I are visiting Paris for a week and we leave on FRIDAY! I am so excited! These are probably a couple of my favorite items in my LIFE right now. A. My iPad is just fantastic. I love having it with me so that I can check email, blog, surf the web, engage in conversation over various social media channels, or google something. It really is a great tool to have on you at any given moment. B. Erin Condren Planner. Need I say more? I adore this planner. If anything keeps me organized, it is this beast of a planner. I keep a lot of things documented in this planner. For example, the contents of my planner could range from my full-time job work schedule, Thirty-One parties, blog posts, fitness activities, and even meals to upcoming appointments, date night ideas, and birthday reminders. The Erin Condren planner is worth every penny. C. As much as I love pens, I love this notebook by Cambridge Limited. The pages are all marked with a "To Do" section and I enjoy checking things off my list each day. It makes me feel productive! D. I always carry a hostess packet along with me wherever I go. You never know when you may run in to someone who loves Thirty-One and wants to earn FREE products! Just for fun, I thought I would show you inside my zipper pouch. Pens, highlighters, Avon Glittersticks eyeliner, and 2 containers of Advil. Apparently I am afraid I will get a headache and not have Advil handy. Ha! That is funny! Perhaps I should get it together! Thanks for having fun with me today! 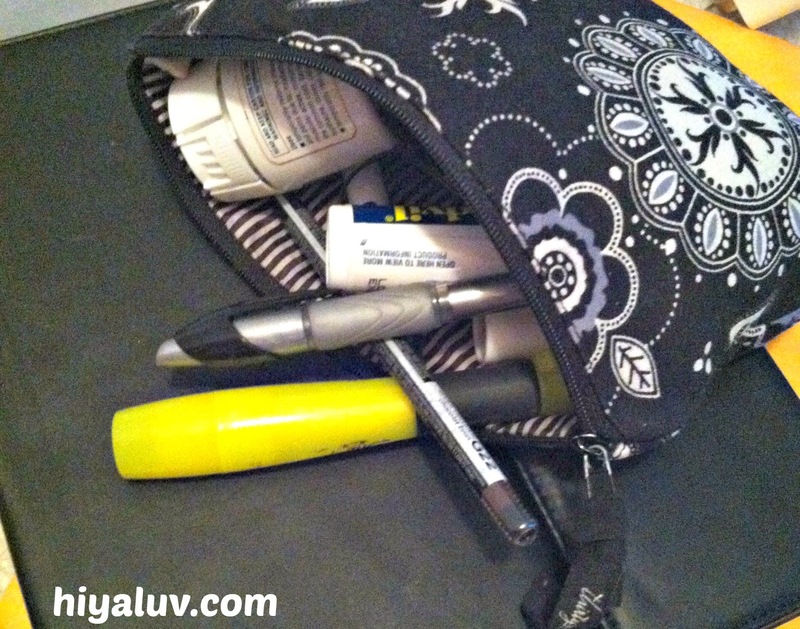 I hope you enjoyed taking a little peak at my life through the contents in my purse! A little sneak peak into my purse probably revealed that I am far from as organized as I thought and that I may be even a bit scatterbrained. I hope you enjoyed taking a peek at my handbag which also gives you an idea of the fast-moving, busy life I lead. 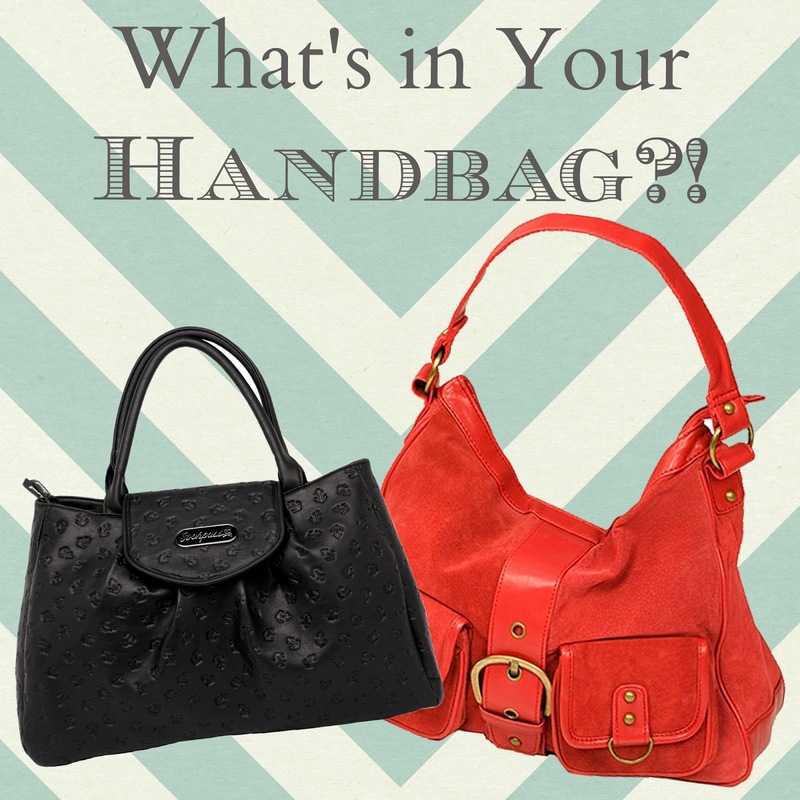 I would love to see what's in YOUR purse! What do you carry around with you every day? Thanks so much for sharing your handbag Gina! !